In the mid-50s, Monsanto chemical company commissioned scientists at M.I.T. 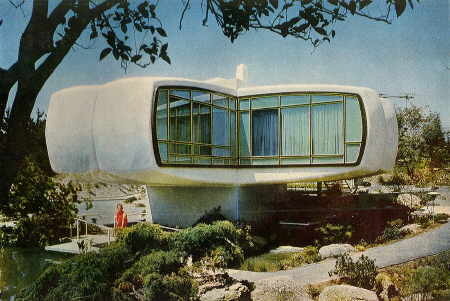 to produce a low-cost prefabricated home that made innovative use of plastic, and the Monsanto House of the Future opened at Disneyland in June 1957, and everything, from the walls to the chairs, was plastic. The house also boasted a compact microwave and a wall-mounted television (which didn’t work, but excited visitors nonetheless). An unintentionally humorous video about the House of the Future can be viewed online, complete with a housewife fantasizing about her perfect life in such a modern kitchen. Millions of people toured the Monsanto House over the next 10 years. In 1967, the house was scheduled to be dismantled. However, due to its durability it proved impossible to wreck by normal means; it needed to be cut in sections and taken apart. That’s the power of plastic.